MANILA, Philippines – The results of the August 2018 Special Professional Licensure Exam (SPLE) for Architecture (ALE), together with the list of passers, top 10 examinees, performance of schools and related announcements are available at this website as PRC officially releases the results online few weeks after the last day of board examination. As announced, 228 out of 326 examinees successfully passed the exams. The August 2018 SPLE for Architecture was administered by PRC Board of Environmental Planning headed by its Chairman, Arch. Robert S. Sac and its member, Arch. Robert M. Mirafuente on August 24 & 25, 2018 at PRC testing locations in Abu Dhabi, United Arab Emirates; Al-Khobar, Jeddah and Riyadh, Kingdom of Saudi Arabia; Bahrain; Qatar; Kuwait and in Oman. The Professional Regulation Commission (PRC) recognizes the top 10 examinees who garnered the highest examination ratings in any of its administered licensure exam. 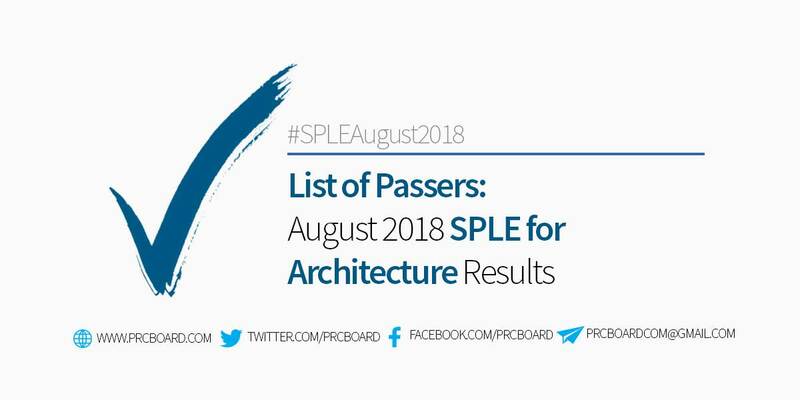 Shown below is the complete list of top 10 examinees for August 2018 SPLE for Architects including the school they're from as well as their rating. The list is courtesy of PRC. Shown below is the complete list of schools' performance for Architecture special licensure exam. To receive up-to-date news about August 2018 SPLE for Architecture results, we advise our visitors to bookmark this page, visit PRC official website or follow us at our social media pages via Facebook and Twitter. Ano na PRC sabi niyo september. Sobra na isang buwan. October na. grabe nde kayo makapag hintay?!!! ako din eh. hehehe PRC labas nyo na po! Sana iprioritize yung SPLE. More than a month na since nagexam, unlike sa Pinas na within 5 days, may result na agad. This system must be aligned. anong problema ng PRC? porket ba nasa ibang bansa hindi na nila aasikasuhin ung SPLE? Nakalimutan ko ng nag Exam pala ako..
MGA GANO PA KATAGAL PRC? WALA ATA MY NAKA PASA. BUTI PA SA LOTTO MAMAYA NA ANG RESULT. MARAMING SALAMAT PO SA BUMUBUO NG PRC.